We launched our ad mediation service about three years ago, and during this period of active work, we began to understand quite well the main webmaster's worries. Today we want to highlight general themes that cause doubts. It?s quite common thought that if you sell traffic to several advertising networks, the chance to get malware increases accordingly, while detecting the source of the malicious software becomes much harder. This is a deep delusion, which is very simple to refute with simple mathematics. Each advertising network comprises hundreds or even thousands of offers. Let?s assume that small part of offers contains hidden malicious programs. With the growth of the number of partners, the number of offers with malware is increasing, but the total number of offers is also increasing, so their percentage remains roughly unchanged. Meanwhile, it?s almost impossible to find manually the source of malware among a large number of narrowly targeted campaigns. It doesn?t matter how many offers you have, 1000, 5000 or 10.000, chances to identify attacker approach to zero. You have to be a clairvoyant to manually find a virus that appears, for example, only for target ?Mexico + android + Movistar provider?. Of course, you can buy all kinds of gadgets, use dozens of proxy servers and try to check everything, but it?s a huge waste of time and money while the effectiveness is comparable to spraying one arm with a repellent and hoping mosquitos not to notice the rest of your body. There are special services aimed to solve this kind of problem. These services check your ads for viruses and aggressiveness, but they are very expensive, therefore, are justified only in case your website brings you a good income, and you really cherish the trust of visitors. On the other hand, large advertising networks with strong reputation are not intended to hide viruses, usually, this is the work of hackers who managed to deceive the system and launch the malware in a particular network. Also, viruses should not be confused with aggressive advertising, these are fundamentally different things. Yes, there are ads with lockers, sounds, and installation of applications, but networks use this type of advertising deliberately, as they are well paid. If you don?t like them, you can ask your manager to turn it off, moreover, usually, you can do it by yourself in your personal account. 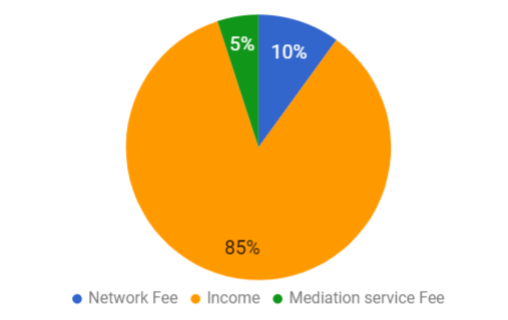 At first glance, it may seem that it is true: you still have the commission of advertising networks, which is 30 to 50%, and now you also need to pay to mediation service, which is on average about 3-10% of your income. But if you will pay attention to details, it turns out to be exactly the opposite. Let?s take a close look at mediation services: what you get and does it worth it? First of all, we want to draw your attention to the fact that if you work, as you used to, with only one network, half of your income goes to the company that cannot effectively sell your traffic. The thing is no single ad network is able to offer a good price for a wide range of targeting, for example, for Russia, Brazil, and America at the same time. And even if it able, it?s not gonna last for long. Secondly, if you're interested in traffic arbitrage, detailed statistics and automatization of actions on its basis is indispensable, and this is a task that can not be effectively solved manually. Finally, to use mediation service you don?t have to pay for it with cash, you can just exchange a small percent of your traffic for it. 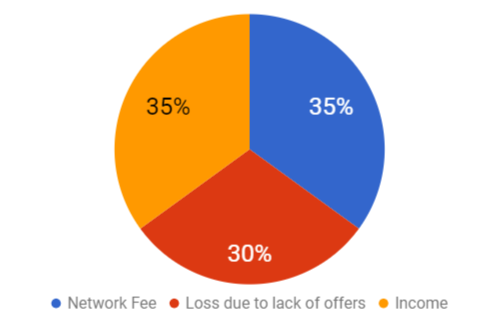 The first diagram shows that part of potential income is lost due to suboptimal traffic management, and according to statistics, this part is quite big, up to 35%. At least 30% of the revenue goes to the commission of the advertising network. As a result, you get only ⅓ from the potential profit. In the second figure, it is remarkable that mediation reduces losses and increases efficiency from 35 to 85%. How does it work? Programmers have a common saying: ?If it works, don?t touch it?. Above we showed quite clearly that the old model works ineffectively, and when we talk about profit, this is equivalent to does not work. Moreover, there?s no need to do many changes, just replace one code with another. If you use the version control system, to return everything back is a matter of two clicks. Hope you understand that it is a commercial promising that has nothing to do with a real offer. In case it would be possible, and such versatile ad network for any traffic and any target would exist, the other networks wouldn?t survive. Even the largest advertising agencies have a number of target groups in which they specialize, and these "special-targets" are different for each network. Of course, ad network wants to have your traffic on hand, it?s convenient to know the exact amount and select orders on its basis. However, this makes you a sort of a backup for the network, subordination changes and now the advertising network takes you traffic for granted. It is quite possible that you will get offers only for third part of your traffic and the rest will be lost. In the best case you will get these leftovers back, but then you will need to decide what to do with it once again. Another point not in favor of working with one network is related to popunders and codes of advertising networks. You can?t manage to popunder, so the ad network might open this annoying ad several times to one visitor. You will never know this but will notice the bounce rate increased dramatically. Managers of advertising networks usually tell that using their code will increase the conversion, and you will earn more, but in fact, the only thing they can do is to show a few popunders to one visitor.